We were delighted to hear that Nintendo and Bitmap Books settled their dispute with the upcoming NES Visual Compendium book, which has been a rip-roaring success on Kickstarter. Now we might have a clue why Nintendo was being so precious about use of its IP in such a book. 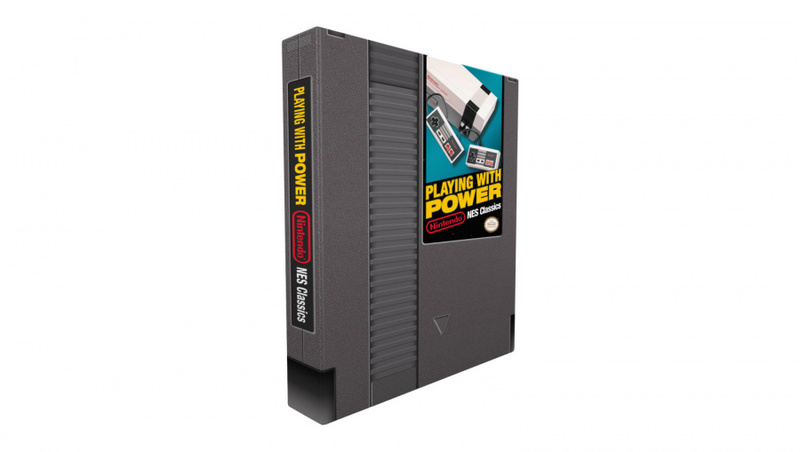 Billed as a veritable love letter to Nintendo fans, an official hardback book from Nintendo (published by Prima Games) entitled Playing With Power: Nintendo NES Classics will be the perfect accompaniment to go with your NES Mini Classic Edition console. Exclusive embossed slipcase holds this hardcover tome in a clever package that resembles a classic NES Game Pak! A fascinating retrospective on 17 NES classics—including Super Mario Bros. 3, Donkey Kong, and The Legend of Zelda! Interviews and commentary from Nintendo visionaries who pioneered this era of gaming. A showcase of vintage advertising and priceless excerpts from Nintendo Power magazine back issues! Plus hand-drawn maps, character and game environment art, and much more! Let us know what you think of the description of this upcoming book with a comment below. Are you excited? What is up with this sudden interest in Nintendo marketing retro NES stuff? The NES 30th anniversary was last year. This seems like it's come straight out of the blue. Now you're playing with nostalgia. I already preordered though I'm a FamiCom guy. The book is available on all EU Amazons as well in English. Amazon Germany is the cheapest so far but I think France and Spain will be cheaper down the line prior to release. Eh, it only covers 17 games? I mean sure, I guess it probably goes pretty well in-depth on them, but Pat the NES Punk just did a book ("Ultimate Nintendo") that reviews the ENTIRE NES library and costs around the same price as this. I'm glad Nintendo's giving some official attention to the classics, but I think the enthusiasts already got that completely covered. That was quick to happen. I'll bet you the Bitmap version is better quality and stuff though. Those guys have real passion for what they're doing. Interesting that there's zero shots of what it's like inside. Glad you got my tweet about this.....Or maybe you found the information yourself. Be nice to have a credit if you did. @Shugo Uh, it's 320 pages, so I'm willing to bet that it goes significantly deeper in its coverage of those 17 games than that other book does on any of the games it covers, which you can see just from looking at the previews that each game gets about one single paragraph of "review" text. This book is clearly not trying to do the same thing that Ultimate Nintendo book is. It's cool. How much is it? I had an inkling this was the case. I lived the era. Don't need either book. Phew...50 bucks for a book? Well I guess that's pretty normal for collectors. That's the price of some new games or 10 NES games on the eshop. o my science, that cover! $50 for this book or $60 for the NES Classic Mini? NES Classic Mini it is! Now your reading with power! Looks quality again with the NES Mini i'll prob get this as a collectors item. But will it fit into the NES mini cartridge slot? Looks cool if I get enough overtime in November i will add this to my collection of books. Does ot include complete strategy guides for all 17 games? The old Game Paks sooo did not have labels on the sides (I know, it's the spine). Probably would have looked pretty neat, though I'm glad they didn't really have them since they'd have made them more difficult to open up for refurbishing. I agree with @Shugo. order Pat the NES Punk's book Ultimate Nintendo: Guide to the NES Library before this or the kickstarter one. Not really. Definitely not buying it at that price. €30? Pfft! And it only covers 17 games? See ya! Should the subheading not say: "Now you're reading with power"? I might pick this up, but i already pre-ordered Pat's book. This may make a nice companion piece though. 26,45€... PREORDER Even if the 320 pages are empty, the cover alone totally worth it! Wow, this looks a lot nicer than the kickstarter book if you ask me. Can't wait to see more of what's inside but 320 pages is pretty huge. @EXP Technically 3 years ago. @BensonUii You too? I mean I should've guessed from your Dracula-kun avatar. I absolutely love collecting for the Famicom, I love how almost every cartridge looks different, and also the mostly unseen to the west yet massively important history of video gaming in Japan. @Snow-Dust Yup, I was thinking the same thing. You know what I think would be great to include with the NES Mini? All of the classic manuals for the included games in one handy book. I preordered this the moment I saw it on Nintendo Life! I really like all the comments from people saying some of the book will be a like a guide book for games and instruction manuals for the 17 games, I'm really looking forward to November but oh man it will be an expensive month. Not gonna lie, the cover alone basically sold this on me. I just read this by going through my emails. Haha. yup, I had a FamiCom when I was a kid. Those times when you have to use trial and error choosing an option because most RPG/Adventure games are in Japanese. @BensonUii You had one when you were a kid? How come? Based on what you said, you didn't live in Japan, then how come you had the Japanese version? Why not buy both (other than price)?